During last week’s health care “vote-a-rama,” prime-time cable news coverage largely neglected the voices of activists, despite their crucial role in helping to block Republican efforts to repeal the Affordable Care Act (ACA). MSNBC hosted five activists during the same time period, but they accounted for less than 10 percent of its prime-time guests included in discussions about health care. Throughout Republican efforts to overturn the ACA, cable news repeatedly failed  to offer diverse voices. Guests in conversations about health care were predominately  white male pundits, while African-Americans , Hispanics , Asian-Americans , and women  -- all of whom stand to lose disproportionately if the ACA is overturned -- received far less screen time. Additionally, cable news programs often ignored  the personal stories of those that would be most affected by Republican health care policies, choosing to focus  on the legislative process, at the expense of the human cost of the GOP’s repeated actions to undo the ACA. As Senate Republicans searched for a way to overturn former President Barack Obama’s signature health care act last week, cable coverage continued to erase the voices of those most intimately involved in the health care debate. 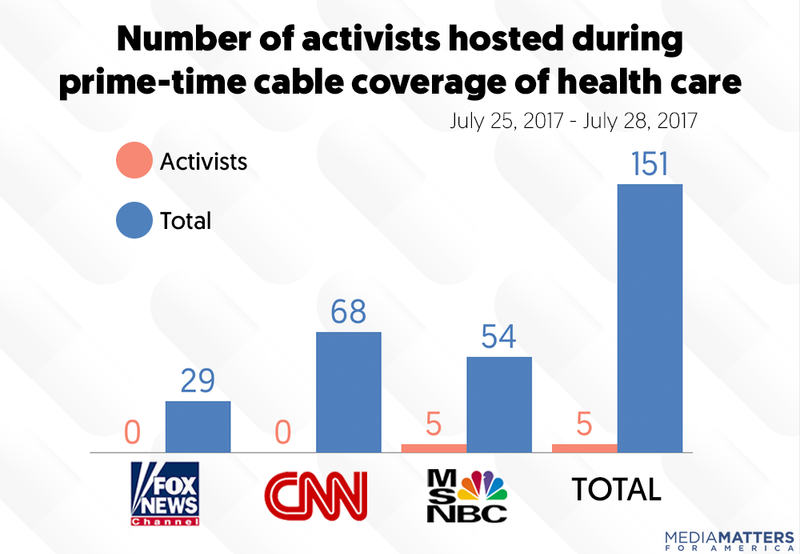 CNN and Fox News failed to include a single activist amongst the combined 97 guest appearances on the channels during discussions of health care, and while MSNBC did host five activists, they made up less than 10 percent of the network's total guests hosted during prime-time to discuss health care. 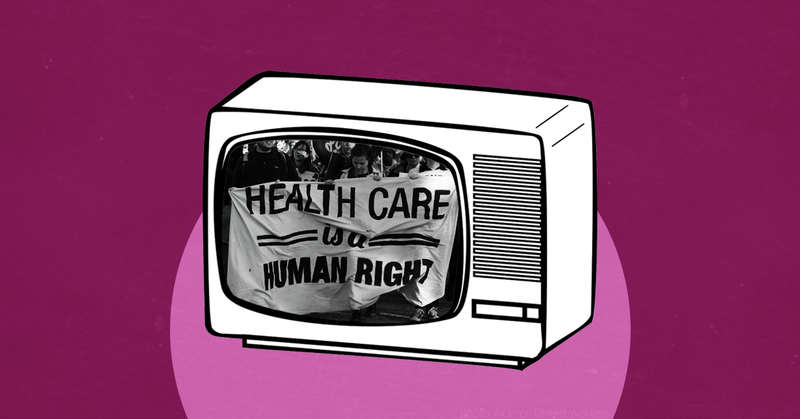 While this isn't the first time  cable news failed to seek out the voices of activists, their disregard for activists' voices is shocking considering the influential role they have played throughout the health care battle. Employees and volunteers for organizations like MoveOn , ADAPT , and Planned Parenthood  organized health care rallies across the country, and helped organize tens of thousands  of calls to House and Senate offices on behalf of the ACA. Activists also kept constant pressure on elected officials, staging all-night  protests in lawmakers' offices, and showing up to elected officials’ town hall  meetings and other  public appearances. Activists played a crucial role in pressuring Senators to vote no on repeal and replace bills, and in keeping public attention on health care in midst of numerous distractions, like  the ongoing investigation into Russian interference in the 2016 elections. Activists deserve credit for their role in the health care battle, and comprehensive news coverage needs to include their voices. Media Matters searched Nexis for mentions of “health care,” “the Affordable Care Act,” “Obamacare,” “Republican health,” “GOP health,” “the Better Care Reconciliation Act,” or “BRCA” on prime-time cable news between July 25 (after the Senate passed the motion to proceed to debate) and July 28 (after the failure of “skinny repeal”). Segments were coded if they included a significant discussion of the Republican health care bill. “Significant discussion” was defined as at least two speakers in the segment engaging on the topic with one another. Guests that partook in discussions that included a “significant discussion” about health care were included in this study. Guests were considered “activists” if they were affiliated with a group actively working against GOP efforts to dismantle the Affordable Care Act. Prime-time cable news refers to CNN, Fox News, and MSNBC weekday programming between 5 and 11 p.m.